CONNECTICUT -- Sophia Skorobohaty was ready to drive her 83-year-old great-aunt, Anna Bollak, to Shop Rite for some Christmas food shopping. But they never made it past Bollak's Bodwell Street driveway Monday. A pit bull bit a hole through a neighbor's fence, jumped onto the 83-year-old Hartford woman, who relies on a cane to walk, and sunk his teeth into her arm. "I was walking her to the van, and I turned for a minute to pull out my keys from my bag," said Skorobohaty, tears welling in her eyes as she retold the incident from outside Bollak's home. "And then the pit bull ran up. It just grabbed at her, and it wouldn't let go. My grandaunt just fainted in my arms because I think the dog just ate part of her arm." The victim, Anna Bollak, was taken by ambulance to Hartford Hospital. Bollak, who turns 84 today, was in stable condition Monday night. She received eight puncture wounds in her right arm, ligament damage and a possible broken arm, police said. 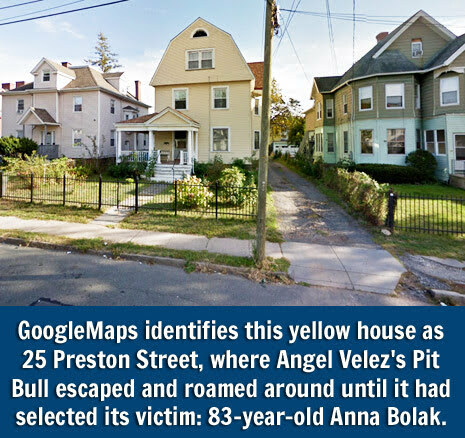 The pit bull's owner - ANGEL VELEZ, who lives on Preston Street behind Bollak's home, was later cited for numerous dog law violations. As Skorobohaty shouted for help, Bollak's husband came outside to try to scare the pit bull away and a resident from across the street ran over to assist. A neighbor called 911. "I was hitting the dog with the cane but it wouldn't stop biting her," Skorobohaty said. Valeriy Kozubenko, who lives across the street, heard the screaming and tried to help. He said he grabbed at the dog's collar and tried to pull the pit bull away from the woman. Several police cruisers and an ambulance arrived. Officer Anthony Romano took a white sheet from the ambulance. Romano was able to tie the sheet around the dog's head. The pit bull bit into the sheet and Romano dragged the dog into the rear seat of a police cruiser. The pit bull sat looking out the cruiser's rear windows until Hartford's dog warden, who arrived a short time later, used a long rod with a collar attached to the end to lead the dog out of the cruiser and into a blue van. As the dog leaped into the van, a voice from a neighboring yard called out, "Do you have a dog there?" It was the pit bull's owner. Anna (Sztuka) Bolak, 94 of Hartford, wife of Wolodymyr Bolak died Monday, (December 22, 2003) at Haven Health Care in Rocky Hill. She was born in Poland and has lived in the Hartford area since 1961. She had worked for St. Thomas Seminary in Bloomfield and was a member of St. Michaels Ukrainian Catholic Church in Hartford. She leaves a stepdaughter, Janina in Poland; two nephews, Nicholas Malnick of Glastonbury and John Nikitich in California; a great-niece Zofia Skorobohaty of Cromwell; a great-nephew Jeffery Malnick of West Hartford; two great-great nieces; members of the Szwed family here in the Hartford area; and other nephews and nieces in Poland. Funeral services will start Wednesday at 8:15 a.m. from the Talarski Maple Hill Chapels, 380 Maple Ave., Hartford followed by a Requiem Liturgy at 9 a.m. in St. Michaels Ukrainian Catholic Church in Hartford. Burial will be in St. Michaels Ukrainian Catholic Cemetery, Glastonbury. Calling hours at the Chapels will be TODAY from 4-6 p.m. during which time a Panachyda services will be held at 5 p.m.